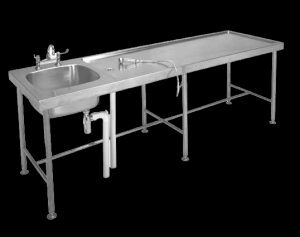 MTS Post Mortem Table and sink (Model MTS) 2565 x 765 x 865 mm high, manufactured from Grade 304 (18/10) stainless steel guage 1,6 mm thick. The rinse bowl/ sink is a 500 x 500 x 230 mm deep pressed bowl with a 40 mm waste outlet. The underside sprayed with vermin proof bitumastic sound deadening and supported with a 30 x 30 x 3 mm framework and galvanized mild steel backing sheet. Unit is fitted on to four 40 mm stainless steel legs and cross braces, each leg fitted with adjustable foot piece. Unit fixed 900 mm high from the top of the front apron to the finish floor level with anchor bolts (bolts specified elsewhere). 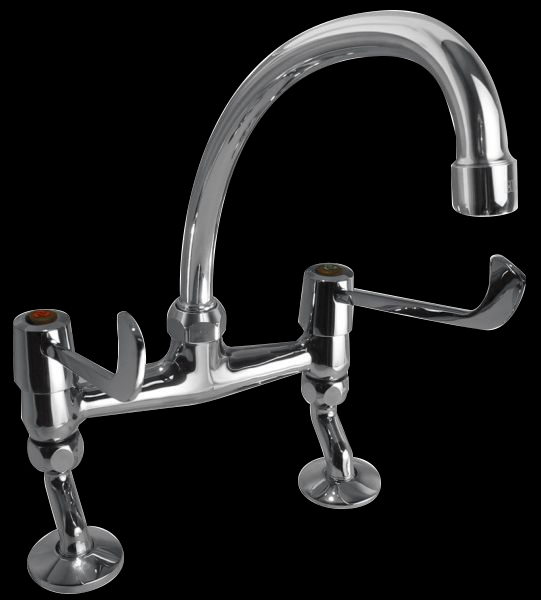 Ideally suited for the MTS post mortem table as this deck mounted tap has elbow action levers and a 200 mm reach spout. It is an industrial tap with ceramic cartridges so maintenance is reduced with increased life span. This tap can also come in wall mounted configuration as some tables might be installed against a wall. Please note: we do not carry stock. Lead time vary per product. All stainless steel custom orders have a lead time of 22 working days minimum and require signing an irrevocable order document.